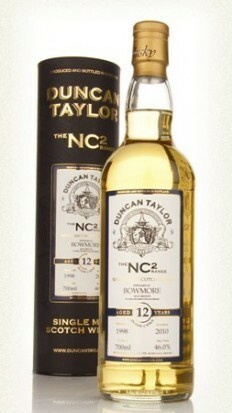 This is from the NC2 series from Duncan Taylor. Light peat and some floral notes in the smell. Citrusy notes and some grass as well, and in the background I sense a little bitter chocolate. Very refreshing smell. A bit more heavy in the taste. The peat has some smoked meat influence and the citrusy notes is not that dominant anymore. Some grass comes forward in the finish, but nothing new besides that. Overall still very fresh though. This is definitely from Bourbon casks, and probably not first fills, as it lacks some complexity in my opinion. There isn’t much flavor from the oak as well… It is a simple, light and fresh, Islay dram. I will give this 83/100 (20/21/22/20).